Cravings are common and normal. It’s often our body’s brilliant way of letting us know which nutrients we are lacking. I frequently hear from clients that they are craving a particular type of food. For some, it’s salty, crunchy chips, for others it’s something sweet and chewy and still for others it’s a savory comfort food that will bring satisfaction. Cravings are an interesting phenomenon, however. On the one hand, we recognize a craving as a signal from the body communicating a need. On the other hand, many of us confuse our physical and emotional cravings. We come to rely on easily available foods for the brief comfort of a quick fix. Ask a pregnant woman who has Pica why she craves dish soap and mothballs and we have quite the conundrum. 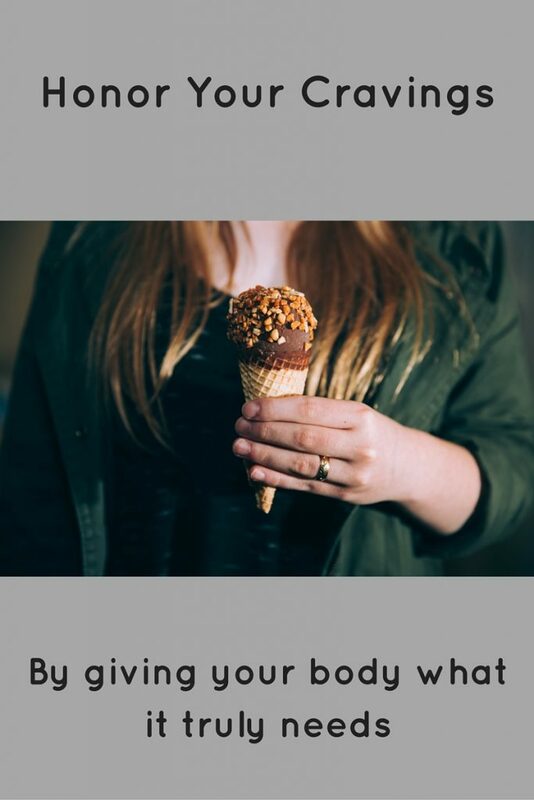 If we cannot distinguish between the emotional cravings and the physical ones, how can we possibly honor our bodies and minds in an appropriate way? Tuning inward and staying there as opposed to looking externally for solutions pertaining to OURSELVES is one way that we can reconcile these two things. Too often, when we crave some sort of food, there is an immediate response – no barrier, no self-discovery and no waiting time…just an itch that needs to be scratched. Mindfulness bridges the gap between internal impulse and the expression of that impulse. What if we were able to scratch that itch and respect what our brain and body demand at the same time? That would be pretty groundbreaking. Another aspect to consider is a craving for specific tastes and textures. For many, food is not just about food. It’s about the experience of eating. It’s about foods that in particular ways meet needs we have. I’ve always been fascinated, for instance, by those who have a “sweet tooth” vs. those who just want chips and fries. Let’s review the specific and most common tastes and textures we seek. Sweet – as human beings we crave sweet foods, which is a survival trait we’ve acquired through the process of evolving. When we were hunters and gatherers, we had to know which plants were safe and which were poisonous. As a result, we humans will innately crave and seek out sweet foods as opposed to bitter, which is an indication that bitter foods may be unsafe. Salty – Salt has gotten a bad rap, but the truth is we need a balance of sodium and other electrolytes that are essential for our wellbeing and survival. Unfortunately, it often comes in the form of processed foods and is high in chemicals and preservatives our body doesn’t need. Sodium and salt can enhance thyroid and adrenal functioning and plays a role in alkalizing our PH balance. Bitter – our preference for bitter foods has taken a long time to evolve for obvious reasons (see sweet), but bitter is alive and well on our palates these days. In fact, there is a whole classification of foods called “bitters” that contribute complexity and depth to various drinks and dishes. Personally, I love nothing more than some fresh bitter arugula in a salad and if we didn’t somehow learn to love bitter, I would have never have developed my favorite addiction….coffee. Sour – Give a baby a lemon and you’ll see that baby pucker up in an instant. Unlike sweet, we don’t have a built in propensity to crave sour. Still, it is a taste that we have learned to love and crave over time, often in combination with other tastes such as sweet and salty. Just think of the digestive juices generated when we think of sour pickles. Umami – this is the more elusive and newer taste category. It’s a Japanese word essentially meaning savory. Some examples would be a Porcini mushroom, a steak, MSG or soy sauce. Crunchy – chips, cucumbers, etc. So, knowing what we know, can we honor the specific taste and texture we desire in that moment? This, as opposed to choosing a food that may result in feeling ashamed, anxious, “off the rails” and to be alarmed at our poor choices. For instance…. craving chips? Maybe it’s the crunchy and salty you’re really after – perhaps cucumbers or pickles could be a good substitute and not create or trigger a food-shame spiral. Dying for something sweet and maybe “chocolaty”? What about trying for a banana and a few squares of extra dark chocolate? You see my point. You can honor the craving without breaking the calorie bank or by wreaking havoc on our health and wellness goals. Next time you’re craving something…. First make sure it’s true hunger and not an emotional or psychological craving for which food is playing the supporting role. (Check out this hunger scale timeline to help you determine this.) Next, get in touch with what that specific taste and texture combination craving you are having. Finally, honor your body and your brain by choosing a taste/texture combination that will be delightful on the tongue and healthy to the body. This is what we call “having-it-all”. What are some of your most common cravings and how do you manage them? Would love to hear your tips and strategies below!